Scientific research now shows the many health benefits of CBD Cannabidiol. Cannabidiol is a component of cannabis but it does not produce the psychoactive effects that have made cannabis attractive for recreational use. CBD benefits are real because CBD does produce strong medicinal and therapeutic effects for even the most common conditions. CBD oil creates homeostasis/balance of all of the bodies cells, organs, and systems because of the Endocannabinoid system. 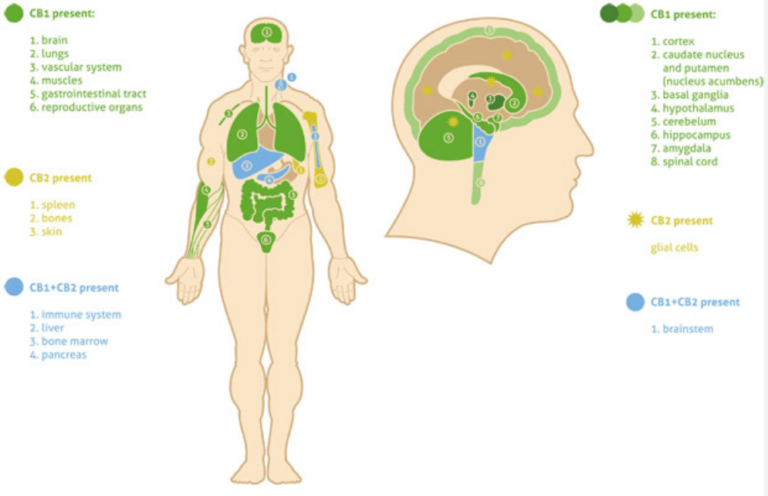 The Endocannabinoid system and it’s cannabinoid receptors CB1 and CB2 are a complex system of the anatomy and physiology found through out our bodies and of all mammals. In fact our bodies naturally produces CBD (cannabinoids). 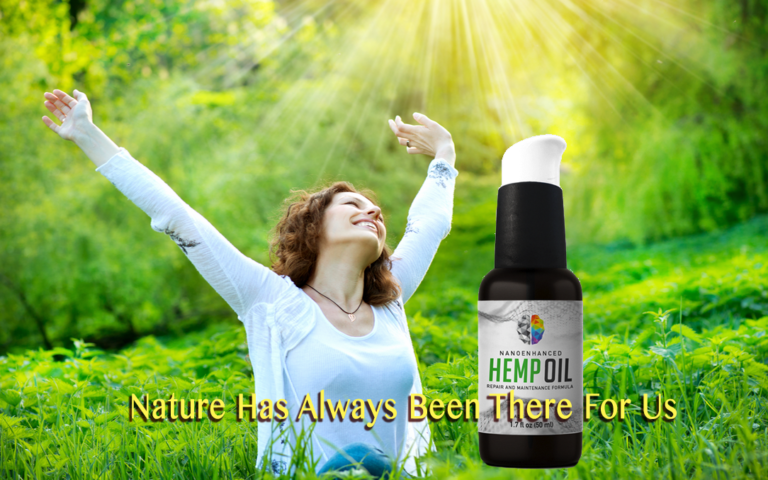 Medical studies, patients, and parents have found CBD oil helpful in treating physical and mental diseases such as epileptic seizures, Autism, bipolar disorder, anxiety, PTSD, depression, Alzheimer, pain, migraines, fibromyalgia, inflammation, irritable bowel syndrome, and MS to name a few. As studies and treatments with CBD oil continues to grow so does the list of benefits. The gastrointestinal (GI) tract houses 80% of the immune system. GI tract also contains cannabinoid receptors. Research has shown that high levels of endocannabinoids are found throughout the digestive system. The CB2 receptor is a bit tricky. In a healthy gut, a 2008 review suggests that CB2 receptors are not very abundant. But, when the GI tract is inflamed and in the case of bowel diseases, levels of the CB2 receptor increase. The CB2 receptor is most common on immune cells. The fact that CB2 receptors are increased in damaged or sickly intestines is a good sign that cannabinoid therapy may be useful in gastrointestinal disease. GI diseases are discussed in more detail below. Research shows that cannabinoid receptors can heal damage to the intestinal lining in diseases like diverticulitis and celiac disease. In a 2010 review, researchers explained that certain endocannabinoids are more abundant in the small intestines of those with celiac. Another 2005 study found that CB2 receptors were over-expressed in mucous membranes (epithelial cells) of the colon. CB2 receptors play a part in the immune system. Activating these receptors with cannabinoid therapy may calm down gut inflammation and heal damaged tissue. In celiac disease, the immune system begins to wage a war on the epithelial cells of the small intestine. The findings that cannabinoids promote epithelial healing is quite promising. No one knows the exact cause of irritable bowel syndrome (IBS), but inflammation in the gut plays a big part in the condition. IBS can cause either diarrhea, constipation, or both. In fact, one 2005 study found that the herb did just that. Cannabis reduces intestinal mobility and can reduce intestinal spasms in those with IBS. Further, pain and visceral (organ) perception are heightened among those with IBS. Some suggest the endocannabinoid system may be partly responsible. Some researchers suggest that irritable bowel syndrome (IBS) is attributed to an endocannabinoid deficiency. This means that, for some reason, the body does not produce enough endocannabinoids. In turn, this causes issues with inflammation and digestive troubles. A review published this year  in Gastroenterology has found that mutations in genes responsible for coding the CB1 receptor are linked to some types of irritable bowel syndrome. As mentioned earlier, CB1 receptors help regulate inflammatory response and motility in the gut. Intense pain, severe intestinal inflammation, ulcers, and endless trips to the bathroom can make life absolutely miserable. Not only is there a wealth of anecdotal information on cannabis for Crohn’s disease, but a few human trials have had positive results. In a small, placebo-controlled study conducted in 2013, almost half of all cannabis-treated patients achieved complete remission. 5 out of 11 patients had unbelievable success with smoked cannabis for Crohn’s disease. 10 out of the 11 showed a clinical response to the herb. Another observational study had similar results. 30 cannabis-consuming patients had improved their quality of life and reduced symptoms in Crohn’s. The patients had a reduced need for surgery after beginning cannabis treatments. Many were also able to reduce the use of prescription medications. The relationship between cannabis and the gut is complex. There is a lot more going on in the digestive tract than most care to admit. This brief article skims the surface of the intricate interactions between cannabis and the intestines. A lack of research still leaves a lot in the dark. Further, this article does not mention the detailed relationship between the ECS, our digestive system, and the trillions of microbes that live in our gut. All in all, the GI tract is like the wild west of the body. Only with time will science reveal more about this complex system. CBD may alleviate severe social anxiety. Generalized Social Anxiety Disorder, or SAD, is one of the most common forms of anxiety disorders that impair quality of life. Some consumers complain of increased social anxiety after cannabis use but this may be due to low levels of CBD proportionate to the higher levels of THC.